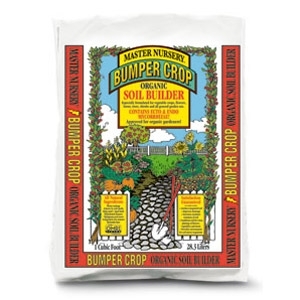 Bumper Crop® Soil Builder can greatly improve the quality of your garden soil. It will loosen clay and other hard, compacted earth, improving drainage, planting texture, and aeration. It will help bind sandy or rocky soils to promote water retention. In all kinds of garden soils, Bumper Crop® Soil Builder will make cultivation easier, provide better moisture absorption and retention, increase all-around soil aeration and provide a beneficial environment for micro-organisms. Available in 1 & 2 cubic foot bags. A blend of lobster shells, manure compost, worm castings, kelp, peat, and aged bark. Inoculated with endo and ectomycorrhizal fungi to improve root function. Everything your plants need in one bag!